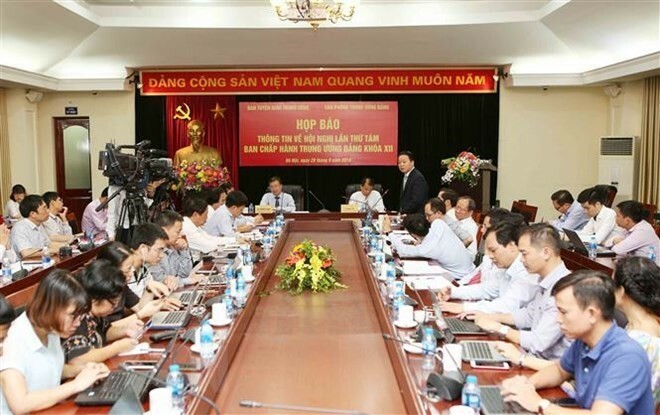 (VOVWORLD) - The 12th Communist Party of Vietnam Central Committee will hold its eighth session from October 2 to 6. Deputy head of the Party Central Committee’s Commission for Information and Education Bui Truong Giang told a press conference in Hanoi on Friday that the session aims to renew communication work, strengthen democracy and transparency, and the Party’s relations with people and organizations in the political system. He added 223 delegates, including 196 members of the Party Central Committee, will attend the session. Deputy chief of the Party Central Committee Office Le Quang Vinh said following President Tran Dai Quang’s passing, Dang Thi Ngoc Thinh, Vice President, now holds the post of Acting President according to the Constitution of Vietnam.